Phoenix is the capital and most populous city of the U.S. Deepen your sense of the past at sights like Goldfield Ghost Town and Strawberry School House. Step out of the city life by going to Desert Botanical Garden and Adrenaline & Extreme Tours. Get out of town with these interesting Phoenix side-trips: Fort Verde State Historic Park (in Camp Verde), Casa Grande Ruins National Monument (in Coolidge) and Lake Pleasant Regional Park (in Morristown). And it doesn't end there: get interesting insight from Tours, admire the landmark architecture of Taliesin West, see the interesting displays at Musical Instrument Museum, and shop like a local with Old Town Scottsdale. To find other places to visit, maps, and more tourist information, read Phoenix planner . The Route module can give you travel options from your home to Phoenix. August in Phoenix sees daily highs of 105°F and lows of 83°F at night. Cap off your sightseeing on the 10th (Sat) early enough to go by car to Grand Canyon National Park. 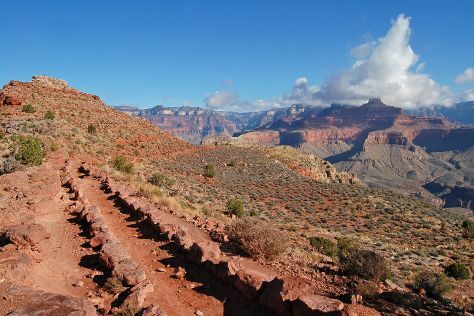 Start off your visit on the 11th (Sun): explore the stunning scenery at Yavapai Point, then get great views at Yaki Point, then trek along South Kaibab Trail, and finally explore and take pictures at East Rim Drive. Get ready for a full day of sightseeing on the next day: take some stellar pictures from Mather Point and then hike along Rim Trail. To find maps, ratings, more things to do, and other tourist information, refer to the Grand Canyon National Park trip planning site . Traveling by car from Phoenix to Grand Canyon National Park takes 4 hours. Traveling from Phoenix in August, things will get much colder in Grand Canyon National Park: highs are around 80°F and lows about 50°F. Wrap up your sightseeing by early afternoon on the 13th (Tue) to allow time for the car ride back home.